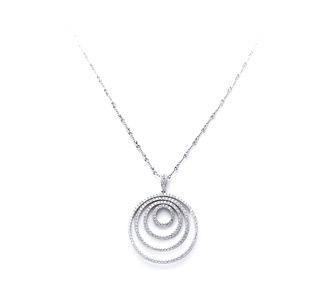 Four graduated diamond circles create a beautifully modern and chic look to this diamond necklace pendant. Borrow this bridal jewelry necklace to compliment a variety of earring and dress styles. Other necklace chain lengths are available upon request. 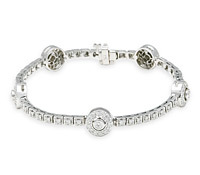 Diamonds: 2.40 TW | Gold: 18K White | 18 in. | Pendant: 1 1/4 in.